Anne and Valentin opt for a deeper comprehension of who their customers are - how they move, live and think - in order to find, for each, the perfect frame, dedicated to the customer’s unique personality and particularities. ROLF Spectacles is a small, family-run company located in the Tyrolean Alps of Austria. The line features hand-made, lightweight wood, stone, and horn eyeglass frames. Each frame is created without any metal parts or screws. THEO eyewear began in Antwerp, Belgium in 1989. The concept behind THEO frames is to create eyewear that turns heads and leaves a lasting impression on those around you. This memorable line of eyewear features bold and colorful designs that you will not find anywhere else. If you are looking to compliment your personality with something truly unique, check out the full collection of THEO eyewear. Bevel Specs is committed to maintaining a classic but minimalist esthetic, using truly high-quality materials with japanese production, and constantly seeking innovation so glasses look, fit, and perform better. MOSCOT is a New York City Institution renowned worldwide for its iconic eyewear — The MOSCOT Originals and MOSCOT Spirit Collections. MOSCOT infuses its unmistakably refined, downtown aesthetic with nearly 100 years of eyewear expertise and unparalleled craftsmanship to create its timeless eyewear. The collection of ic! berlin eyewear features their patented screwless hinge system, ensuring your glasses will never loosen over their lifetime. This German luxury brand has created the perfect combination of fashion and function. Each piece of the Martin and Martin eyewear collections is handcrafted in Germany. The charismatic line is pleasing to the touch and eye, featuring superb materials with velvety earth and sand colored designs. Each frame in the De Stijl eyewear collection bodes the inspiration behind their creation: harmony through the use of lines and right angles. The various elements of the De Stijl’s clean designs feature the complete absence of screws or welding by the hinge, ensuring your spectacles can never loosen. Sleek, timeless, technical luxury. The Porsche Design eyewear collection features functional styling blended with innovative technology. Each frame is engineered to provide luxurious comfort built to the highest standards. Frederic Beausoleil frames feature playfully combined rich colors, classic shapes, and a touch of glamour. This Parisian line of eyewear crafts their frames with the finest materials and innovative techniques available today. Simple and elegant designs make up this collection of French eyewear. The retro-inspired features of Jacques Durand frames are created with a focus on quality and sophisticated technical elaboration. Strong colors and bold shapes comprise this aesthetically pleasing line of eyewear. Anglo American eyeglasses has a history that began in 1882 on the streets of London, England. With 120 years of making quality eyewear under their belt, Anglo American frames continue to focus on maintaining high quality and construction standards. The designs throughout their collections are both fashionable and utilitarian. This international high-end line of eyewear for men and women was founded in Nice, France in 1950. The Façonnable collection of frames is extensive. Their designs range from vibrant and trendy, to elegant and subdued. Refined luxury without ostentation is the hallmark of a Façonnable frame. Founded in 2007, France-based Vue DC eyewear is a collection influenced heavily by the silhouettes of the 1930’s and 1940’s. A personal touch is placed in each frame while they are being individually handcrafted. This retro-style line pays homage to the past with their fashion-forward styling of today. 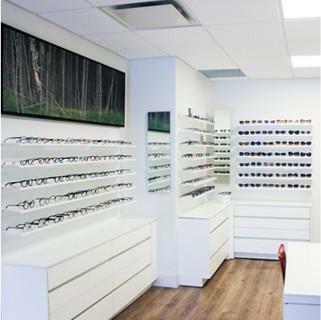 Say good-bye to dry with one of Canada’s most trusted brands by Canadian Eye Care Professionals because of their comfort. This contact lens features next generation HYDRACLEAR PLUS Technology that can keep your eyes comfortable all day long, even in the dry surroundings that Alberta can offer. An innovative contact lens designed to help maintain the natural state of your eye. As the first and only daily disposable contact lens made with Hydroclear Technology. Say goodbye to solution, lens cases and hassles. Say hello to 1 DAY ACUVUE MOIST. Exceptional comfort from the moment you put them in to the moment you toss them at the of the day, this lens is the only daily disposable with Acuvue’s exclusive LACREON Technology. Utilizing silicon hydrogel technology, Air Optix contact lenses are well known for comfort and oxygen permeability. They are available in a variety of prescriptions and varieties, including toric lenses. AIR OPTIX COLORS offers a wide variety of colors, from subtle to vibrant effects. You will enjoy the stunning colors while feeling comfortable with their smooth surface technology. Every pair is breathable, which allows for healthy-looking eyes, whether with or without vision correction. Unlike many other silicone hydrogel lenses, Biofinity contact lenses incorporate a naturally wettable material that maintains a hydrophilic (water loving) property throughout the lens. This means no surface treatments, additives, coatings or wetting agents are needed. Discover a new era in contact lens comfort. Designed with a surface of over 80%* water content, nearly the same as the surface of your eye, for a feeling of exceptional comfort until the end of your day. Leis Vision is a leading contact lens provider that supplies superb quality lenses around the world. They aim to provide lenses for challenging eye conditions. Using the latest materials, as well as their own custom-designed materials and technology, Leis Vision contact lenses provide excellent solutions for the most demanding eye cases. Bausch + Lomb PureVision contact lenses are made using AerGel material. Unique to PureVision, this material offers outstanding comfort and health, and you will be able to experience life with visual clarity and a level of comfort that your lifestyle may demand. The PureVision Family includes: PureVision, PureVision 2, PureVision Toric and PureVision Multifocal. Several decades of evolution and innovation have resulted in extremely comfortable gas permeable lenses. ROSE K lenses closely mimic the cone-like shape of the cornea for every stage of Keratoconus. Each lens is customizable, easy to use, and incredibly comfortable.